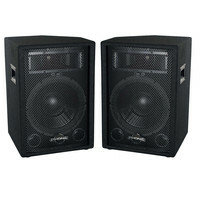 The Phonic SEM710 Passive PA Speaker Pair is an affordable passive PA speaker package which can be used as either a floor monitors or front of house speakers. Housing a single 10 inch woofer and piezo tweeter per speaker the SEM710 PA Speakers produce up to 160 watts RMS (Peak) perfect for small capacity venues or acoustic sessions. The Phonic SEM710 speakers are constructed from a robust wooden enclosures and also feature side mounted carry handles and steel corner protectors.